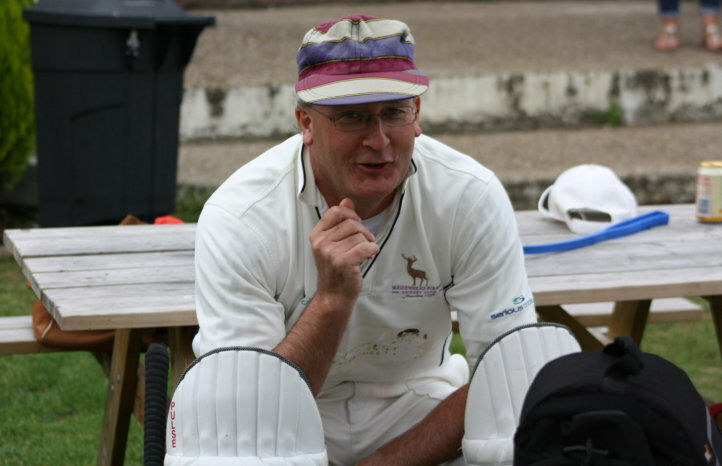 M & B couldn't mark Sean Phillips-Williams last game with a win as they were easily beaten by 8 wickets by The Thames Valley Ramblers on a bright and warm early September Sunday. Skipper Armstrong had no hesitation in batting upon winning the toss, thereby thrusting Ben Ward Snr and a hung over Sean into the fray. Sean was off the mark first ball though, dispatching a full toss to the extra cover boundary. Ben was equally dismissive in the next over, dismissing a short pie to the square leg boundary and then playing his trademark lofted drive to the mid on boundary. Alas Sean's final innings for Bray was ended in the third over as he cut a short wide delivery to the point fielder. Despite a majestic flick over the midwicket boundary, local rugby star Kieran Grey, did not hang around as he was caught behind as he played an expansive off drive to Singh's full delivery. Ben Ward also perished in the next over in unusual circumstances. Despite having his timbers rearranged as he aimed to hit Boxall over the top, he was given a reprieve as the umpire called a no ball. Having hit the next delivery over mid on for 2 Ward was then bamboozled by a Boxall slower ball, which left Ward perplexed as his timbers were rattled once again, alas no reprieve this time as he was sent on his way for 13. Sunday veteran Tifler was castled in the 8th over to leave M & B perilously placed at 27for 4 after 8 overs. This left Armstrong having to hurry to get changed as no.8 Shabs Mookhtar had informed his captain he had to make a trip to the recycling tip, as you do! Despite being extremely worse for wear George Parsons was able to remain at the wicket and build a partnership with Gunbarul, who eschewed his natural aggression for the team's cause. Both batsmen rotated the strike early on waiting for the bad ball to put away. Parsons was strong through leg and was able to play his trademark clip to leg to a few full tosses, which were dispatched to the boundary. Parsons showed his all round strength as he played a beautiful square drive to the point boundary to a wide full delivery. Gunbarul benefited early in his innings with a quick single which led to an overthrown boundary and a 5 being added to his score. Gunbarul eventually began to find the boundary with regularity as the pair took the total to 88 for 4 at drinks(20 overs). Parsons was keen to get down the wicket to the bowlers to meet the ball on the full. Skipper Armstrong made the mistake of asking the scorer for the score and was told Nelson, as Parsons was promptly bowled by spinner Jameson, making a ghastly swish across the line, to end his stay of 17 overs for 34, and sweat some of the alcohol out of his system. Still a fine rescuing partnership of 84. Gunbarul was joined at the wicket by Swapnil Manchanda, who was keen to show he could score runs without the aid of the sweep. Manchanda scored a couple of early boundaries through the third man region. Gunbarul reached his 50 with a cover drive but was out shortly after lbw for 51, which included 6 4's and a 5 and lasted 21 overs. Manchanda, for a change, seemed comfortable at the crease as he rotated the strike. Shabs Mookhtar, making a rare Sunday appearance, came and went, with one memorable hit to cow for 4 and another less memorable reverse scythe bringing about his dismissal. Manchanda was joined at the crease by Armstrong but alas the partnership didn't last. Manchanda played one elegant clip off his legs for 4 but then tried to work a straight ball to leg and was lbw for 28. Ambar Moorthy was tamely dismissed, clean bowled playing a tentative forward defensive to leave M & B 161 for 9 in the 36th over, with only old stagers Armstrong & Chris Butler left. Armstrong managed to find the cover and leg side boundaries as the pair took the total to 177 before Armstrong was comprehensively bowled in the 39th over by Boxall. 177 was a well below par total but from 27 for 4 was acceptable. Ambar Moorthy & Shabs Mookhtar opened the bowling for M & B against the annoying left hand / right hand opening combination for The TVR's. Moorthy struggled with his line early on against the left hander but the umpire was lenient with the wides. Shabs' angle and bounce made it an awkward proposition for the batsmen. Moorthy eventually got his line to the left handers and beat he left hander consistently, as did Shabs. Alas no early breakthroughs as the TVR's built a sold platform. Sarao rode his luck and was dropped badly by Ward at mid-off but Shabs got his reward as Sarao chopped on to leave TVR's 34 for 1 in the 11th over. Both Moorthy and Shabs bowled through their eight over allocation both with frugal figures, albeit their were a few byes as a result of poor deliveries. Shabs Mookhtar finished with figures of 8/2/17/1, ably assisted by Moorthy, 8/2/21/0, as TVR's were 46/1. Armstrong brought both his spinners on first change, Chris Butler having not played for two months, due to the number of cancellations that had taken place when he had been available(oppo cried off, World Cup Final and rain occurrences) and Manchanda. Not surprisingly Butler was rusty and the batsmen scored freely. Manchanda started with a head high full toss, which was no-balled and hooked for 4. The field spread as the spinners could not contain the bowlers and the fielding became ragged as the batsmen ran quick singles. With less than 50 required Armstrong surprisingly called Parsons to the crease and the decision almost bore fruit immediately but Parsons was unable to hand onto a regulation return catch as Singh's prod went straight back to the bowler. Gunbarul entered from the Road End and bowled his traditional seam for the first over before insisting on bowling his version of spin, which looked like quick cutters to everyone else. After two overs Parsons began to struggle with his line and length as he began to feel unwell as the beer churned in his stomach as he ran to the wicket. Spin or not Gunbarul managed to garner M & B a second wicket as he castled Singh Gill for 74, making The TVR's score 167 for 2. Singh on 57no saw the TVR's home in the 36th over for an easy 8 wicket win.